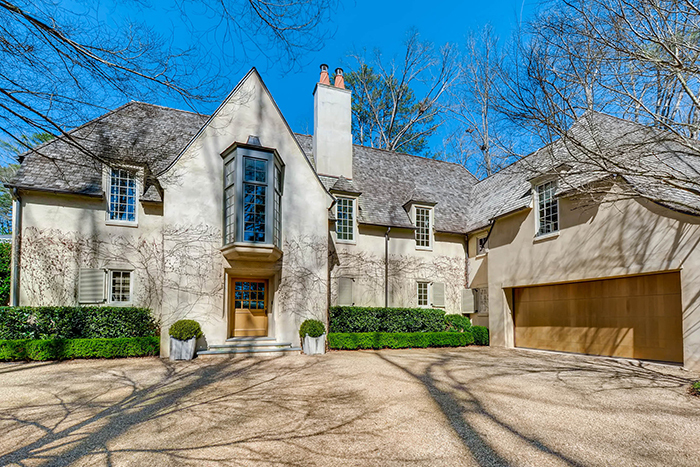 Buckhead is known for its style, and the estate at 401 Argonne Drive raises the bar. After all, how many available residential properties are products of one of America’s top 100 architects, according to Architectural Digest? The more than 6,200-square-foot residence designed by Bobby McAlpine features soaring steel windows, exposed beams, Venetian plaster, oak floors, European hardware and custom ironwork. The Benecki Homes property offers a stately master suite with separate baths and closets, three junior suites with sitting rooms and baths, a four-car garage, two laundries, a spacious terrace-level media room, a gym and a swimming pool. Recognizing that a person enters their home long before they reach the front door, Stan Benecki and his wife Melanie Turner, a Veranda two-time Southeastern Designer of the Year, emphasize the balance between man-made and natural environments, indoors and outdoors. Built in 2011, the European-style home in Atlanta’s top residential district seamlessly embraces its beautiful hilltop setting. “Poetic layouts and soulful decor” is what separates McAlpine and the rest of the 2018 AD100 – Architectural Digest magazine’s ranking of the top designers in the country – and it is readily apparent at 401 Argonne Drive. Whether it’s designing stunning Southern homes, penning his third book, "Poetry of Place" (released in late 2017) or attracting celebrity clients such as Faith Hill and Tim McGraw and Harry Connick Jr., the Alabama native makes a special habit of fusing the uncommon with the substantive, the relatable, the attainable. Click here for a virtual tour of 401 Argonne Drive. For more information, please contact Dorsey Alston Realtors’ Shanna Smith at 404-229-7958.